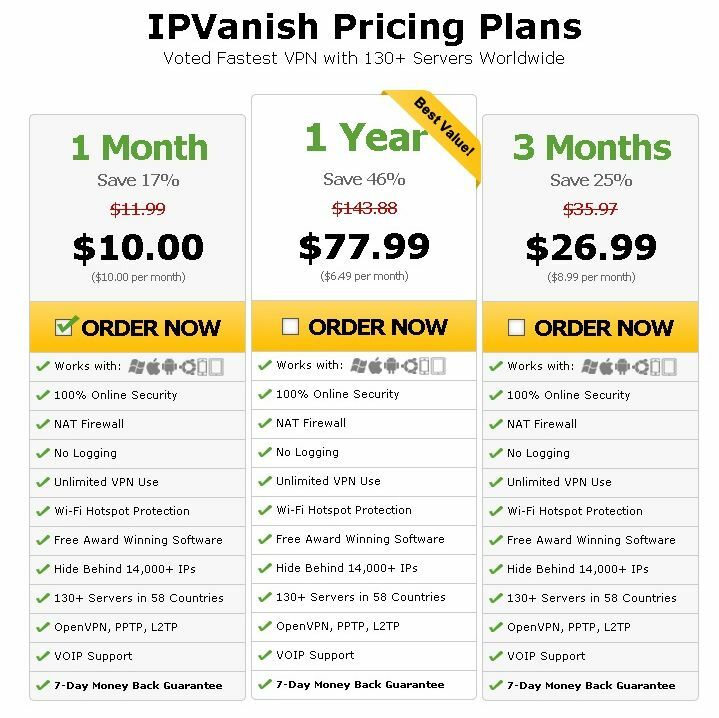 IPVanish is a popular VPN which promotes itself as the only tier-1 VPN network. They specialize in offering fast connections, servers around the world, and high levels of security. With 59 countries and more than 14,000 IP addresses, they offer a diverse menu and plenty of flexibility for your VPN needs. They do not have a free version; this is a paid service only. TIP: There is a free three-day trial, however, as well as a seven-day money-back guarantee. If you purchase only one month at a time, it is more expensive than a lot of other VPN services, but it is comparable if you purchase a year package at a time and take advantage of the annual discount. Browse the internet as if you are living in another country. This is not a Eurocentric VPN service; you will find severs all over the world here, including in Asia, South America, Central America, Australia, and even Africa. This is great for accessing blocked content. Increased security and privacy. While you are browsing the web on a public network, you can enjoy improved security through advanced encryption and powerful protocols. A firewall is included as well as wi-fi hotspot protection. Additionally, there is no logging, so if that is something which concerns you, you can feel safe browsing with IPVanish. Speed up your Internet connection. Some Internet connections may be enhanced running IPVanish. Throttling is more and more of a concern these days, especially in the USA. 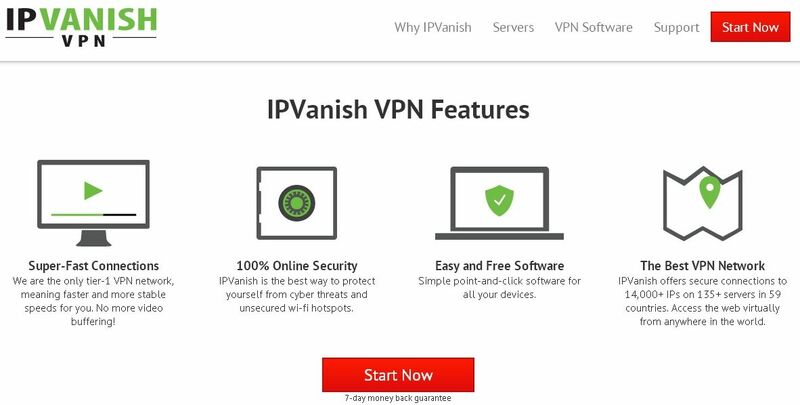 With a VPN like IPVanish, you can stop your ISP from throttling your traffic. Is IPVanish right for you? Let’s take a look at the supported operating systems and devices, and then delve into the pricing plans and the features included. We will also talk about customer reviews of IPVanish online. Microsoft Windows: Windows 7/8, Vista, XP. iPad, iPhone, and iPod: Yes. IPVanish supports more operating systems than many VPNs, which makes it more likely to be compatible with your device. This is one of the only VPNs right now which lists Chromebook. You can also run IPVanish on your laptop, Macbook, desktop, or mobile device. As previously mentioned, there is no free version of this software. You can test drive the program for three days though before you have to pay. This should be enough time to figure out if IPVanish is what you are looking for. At that point, you can choose a package to purchase. It is usually a good idea to start with one month and then choose a larger package once you have given the program a longer (paid) test drive. There are no account tiers for IPVanish; when you purchase any package, whether one month, three months, or a year, you get all of the features included with the program. This is why the program is a little more expensive than some other VPNs, which include reduced-price versions with restricted features. If you purchase just one month, you will pay $10.00. Right now, there is a promotion for 20% off, which can save you some money (wait for a few seconds on the page and you should see the offer window appear). If you buy three months, the price drops to $8.99 per month ($26.99 total). Or you have the option of buying a full year. The one-year plan costs $77.99, which comes out to $6.49 per month. This is comparable to what you would pay for most less expensive VPN services, and is a great deal since all the features are included. There is a seven-day money-back guarantee on your purchase. So in effect, you have a longer time period to test the software without any risk than the three-day free trial. Ten days combined should be plenty of time to make up your mind. The IP address pool for IPVanish is huge. There are 66 servers in Europe, 42 in North America, 17 in Asia, six in South America and Central America, three in Africa, and three in Oceania. Combined, there are more than 14,000 IP addresses to choose from. Most VPN services are heavily concentrated in North America and Europe, with few or no choices throughout the rest of the world. Servers in Africa are quite uncommon, so this is a cool feature. Most companies only offer a single server in Australia as well, so it is also great that there are several options in Oceania, including in New Zealand. There are no bandwidth restrictions on IPVanish. No matter how many months you purchase, you are permitted unlimited (within reason) use of the service. So if you do a lot of browsing, downloading and streaming, this may be an excellent choice, especially given the high speeds, which we will discuss momentarily. 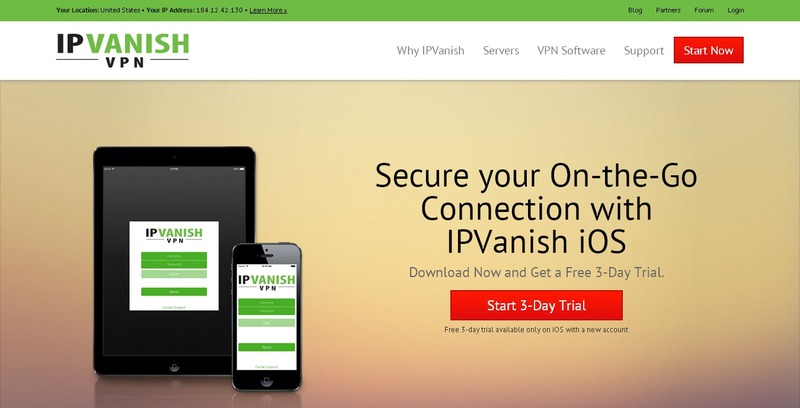 The IPVanish user interface is simple and easy to use, even if you are new to VPNs. You will see in the upper right-hand corner of the screen whether you are connected or not. You can easily scroll down through a list of servers and choose a location to use as your proxy. You can select a protocol under preferences and set up automatic connection preferences if you would like. IPVanish is given 3.5 out of 5 stars on both Google Play and Apple iTunes. There are at this time more than 670 reviews on Google Play. Most report that the application is stable and reliable with few or no disconnects, but there are some users who seem to have problems connecting through the app. Be sure to test before you buy. Speed is definitely an area where IPVanish excels. Since there are so many servers, it is easy to get reliable, fast speeds. There is no throttling, and the software can help you get around traffic shaping by your ISP. Many users will notice their connections actually speeding up. Others can expect speeds which are comparable to their usual speeds. This is another great reason to consider IPVanish if you are looking for a VPN specifically for gaming, streaming or downloading. The encryption you get will depend on the protocols you select when you connection. OpenVPN for example uses 256-bit AES CBC. In-depth encryption information is available on IPVanish’s website. They are very transparent about encryption, which is great. On some VPN sites it can be hard to find that information. We did run into a number of discussions about security concerns involving DMCA requests. Apparently specific users have from time to time received DMCA requests, despite the fact that the company does not retain logs. The question appears to have been adequately resolved however. If you are interested in the details, you may read them here on the IPVanish forums. IPVanish does not log. They do occasionally forward requests when issues with DMCA arise in real-time. You will have to decide for yourself if this is something which concerns you. Any other VPN would likely do the same. Customer support for this program has received mixed reviews (which sadly is quite common with VPNs). Some customers have complained that tech support is not the best, but billing support has received positive reviews. One customer who decided they did not want the service after trying it was able to get a refund within ten minutes, and left a positive review purely because the customer service experience was so pleasant. Customer service also appears to be responsive on user forums. With hundreds of servers and more than 14,000 IP addresses to choose from, you will never have a problem finding a fast and reliable connection in a country of your choice. For users looking for servers in Asia, South and Central America, Africa or Oceania, this program is an excellent option. Powerful encryption algorithms and extra security features like firewall protect your connection. There is no logging. IPVanish is renowned for its speed, and may even improve your connection. Customer service is largely responsive, fast, friendly, and knowledgeable. The company is transparent about security policies and interactions with authorities. There may be connection problems on some devices. No free version; free trial only lasts for three days. Overall, IPVanish is an exciting program with excellent reviews and a strong reputation. Make sure that if you do decide you are interested in IPVanish that you check to make sure the program works on all your devices before the end of the trial period. Pay for a month of service before you decide to take the leap and purchase three months or a year. If you do decide that IPVanish is the right program for you, the one-year subscription is an excellent way to save money.